Limeslade Bay Beach01792 468321work BeachLimeslade Bay is a small cove just to the west of Bracelet Bay in the south east corner of the Gower Peninsula, near Swansea. It is a sheltered, mainly rocky beach with little sand. Bathing is possible. From the Bay there is a cliff walk to Langland Bay, about half a mile to the west. Limeslade Bay is a small cove just to the west of Bracelet Bay in the south east corner of the Gower Peninsula, near Swansea. 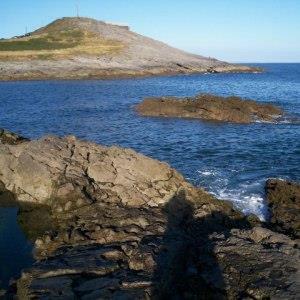 Toilets, refreshments, parking at the adjacent Bracelet Bay; dogs not allowed May to end September. From Swansea, take the A4067 Mumbles Road; at a mini roundabout, straight on signed for Bracelet Bay and continue on this road (B4433) past Mumbles Head to the Bracelet Bay car park on left.